Hello, and welcome back to Monthly Marvel Muster. It’s been a while, and rather a lot has happened since my last post in February. There’s too much to go into in any detail, but I’ll try to hit the high notes. 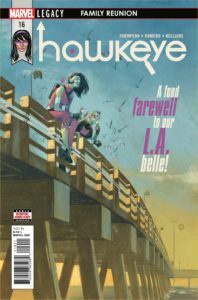 May represented the beginning of Marvel’s “Fresh Start,” their latest attempt to revitalize sales with new #1 issues of their most popular series, from big name writers and artists. 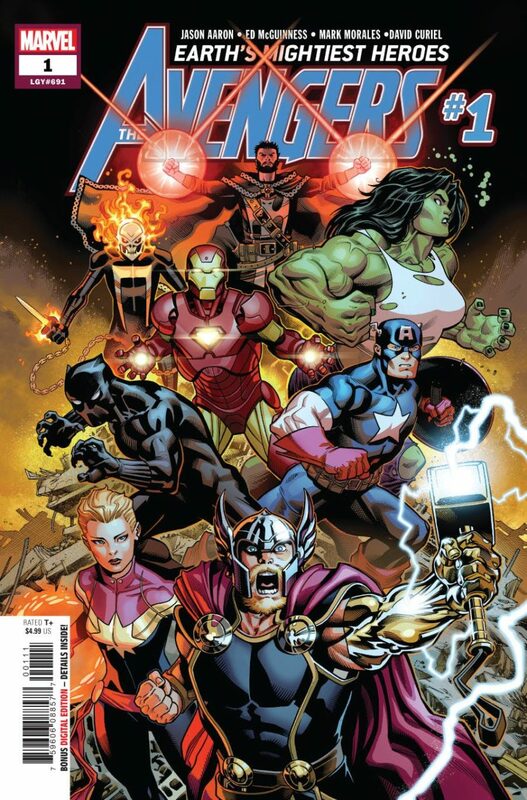 The weekly Avengers: No Surrender mega-event ended in April, and was replaced by a new Avengers ongoing written by Jason Aaron, with art by Ed McGuinness. 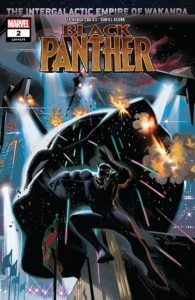 Ta-Nehisi Coates’s run on Black Panther, most recently with Leonard Kirk on art, ended in April and was replaced by a new ongoing, still written by Coates, but now with a very different art style provided by Daniel Acuña. Mike Costa’s run on Venom with various artists, but primarily Gerardo Sandoval and then Mark Bagley, also ended in April, to be replaced by a new ongoing by Donny Cates and Ryan Stegman. June brought even more new series, starting with a new Thor ongoing, now starring Thor Odinson again instead of Jane Foster, still written by Jason Aaron, but with Mike Del Mundo stepping in to replace Russell Dauterman on art. 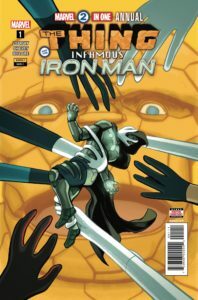 Brian Michael Bendis, Stefano Caselli, and Alex Maleev’s Invincible Iron Man starring Riri Williams ended with the resurrection of Tony Stark in issue #600, and has been replaced by Tony Stark: Iron Man by Dan Slott and Valerio Schiti. So far, the “Tony Stark” designation at the beginning of the title seems to be there to reassure readers that Tony is back in the leading role and not as an indicator that Riri will also still have her own series. Greg Pak’s Amadeus Cho-starring Incredible Hulk came to its conclusion in May, and a newly resurrected Bruce Banner is now starring in the horror-tinged Immortal Hulk by Al Ewing and Joe Bennett. 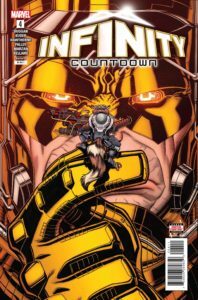 Continuing the recent theme of bringing back legacy numbering to end series on landmark numbers, Gerry Duggan’s five year run on Deadpool ended with issue #300. Deadpool’s inevitable new series is written by Skottie Young, with art by Nic Klein. Mark Waid is now writing Doctor Strange, with art by Jesús Saiz. They’re sending him into space, because why not, I guess? In July, Mark Waid’s short second run writing Captain America with art by Chris Samnee and then Leonardo Romero is being replaced by a highly-anticipated new series by Ta-Nehisi Coates and Leinil Francis Yu. 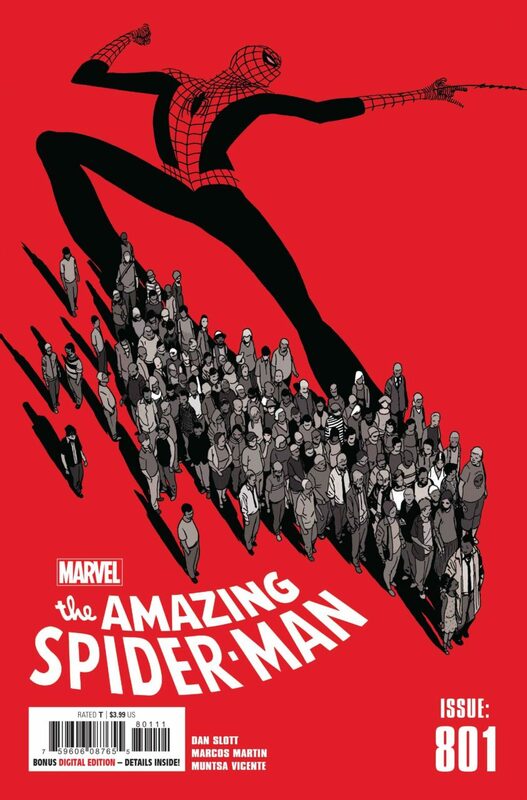 And in the biggest change, Dan Slott has ended his ten year run on Amazing Spider-Man with issue #801. Peter Parker’s new series is being written by Nick Spencer, with art by Ryan Ottley. Spencer is best known for the “Secret Empire” storyline in which Captain America turns evil, so I’m rather concerned with what shocking plot twist he might have in store for the other most-beloved Marvel character. 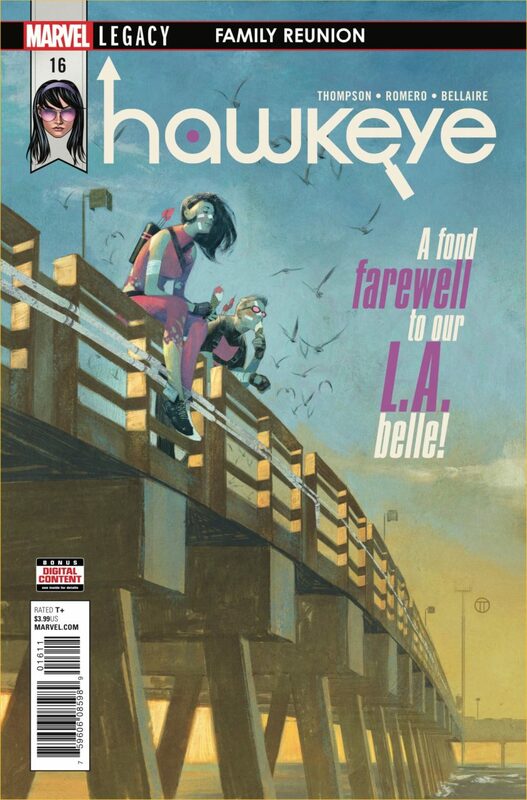 In January, many of Marvel’s best-known young legacy heroes had their own solo books. Miles Morales starred in Spider-Man, Riri Williams was headlining Invincible Iron Man, Amadeus Cho was The Incredible Hulk, Kate Bishop was starring in Hawkeye, Laura Kinney was the All-New Wolverine, and Jane Foster was The Mighty Thor. As of now, the only one left headlining a solo book is Laura Kinney, whose new series as X-23 begins in July. 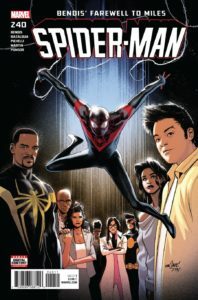 Miles, Riri, and Amadeus are still in Champions, Kate is about to lead a new West Coast Avengers team, and Jane continues to play a part in the new Thor, but the era of legacy heroes starring in big name solo books seems to have come to an end. 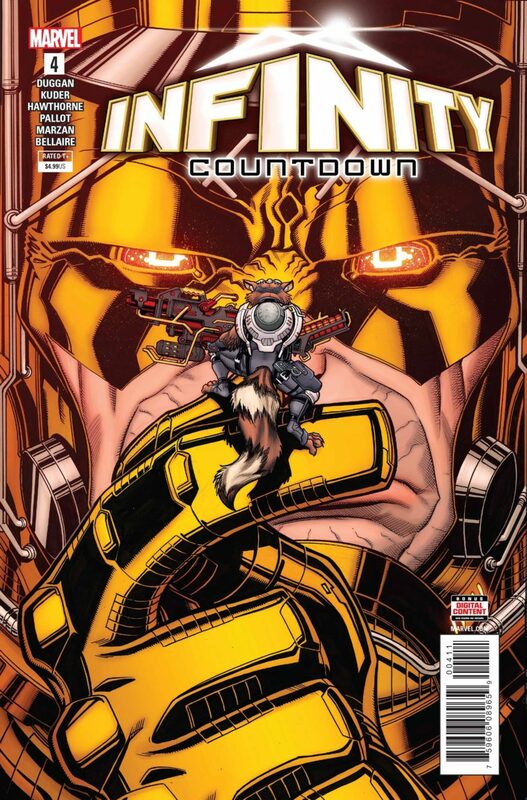 Guardians of the Galaxy wrapped up in January to lead into this summer’s Infinity Wars event, but first there is the pre-event Infinity Countdown event and a handful of tie-in one shots and mini-series starring Captain Marvel, Black Widow, Daredevil, the Champions, and lesser-known ’90s hero Darkhawk. The much-hyped return of the original Wolverine has been building all spring, starting with cameo scenes at the end of various books and leading into four “Hunt for Wolverine” mini-series: Hunt for Wolverine: Adamantium Agenda by Tom Taylor and R.B. 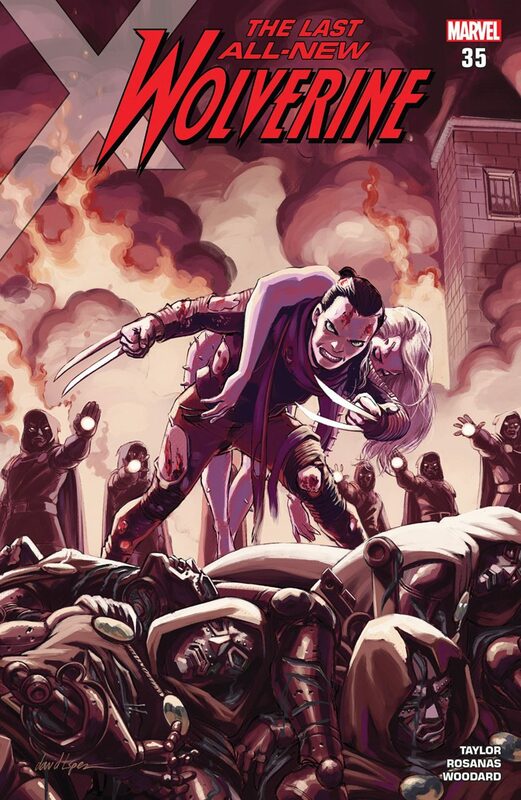 Silva, Hunt for Wolverine: Claws of a Killer by Mariko Tamaki and Butch Guice, Hunt for Wolverine: Mystery in Madripoor by Jim Zub and Thony Silas, and Hunt for Wolverine: Weapon Lost by Charles Soule and Matteo Buffagni. Marvel’s also clearing the way for Logan’s return by ending the Laura Kinney-starring All-New Wolverine by Tom Taylor and returning Laura to her X-23 moniker with a new series by Mariko Tamaki and Jaunn Cabal. I’m sad to see a series I’ve loved so much ending, but I have pretty decent hopes for the new series. Tamaki is keeping Laura’s clone-sister Gabby, a.k.a. Honey Badger, and their pet wolverine Jonathan as part of the cast, which hopefully means the new series will be similar in tone to its completely delightful predecessor. As a fan of Rogue and Gambit together, but not of Kitty and Piotr’s relationship, I’m quite happy with this turn of events, but I know not everyone is. 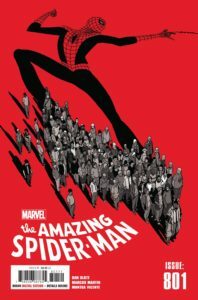 As has become increasingly common lately, Marvel spoiled the issue themselves the day before release with a story in the New York Times. Readers and retailers were understandably disappointed by Marvel’s continued decision to prioritize publicity and potential new readers over the concerns of the readers and retailers who are already invested in a book. Besides the ones mentioned above, these other books have ended since January: She-Hulk, Captain Marvel, America, Falcon, Gwenpool, the Unbelievable, Jessica Jones, Defenders, Iron Fist, Luke Cage, Iceman, Generation X, Monsters Unleashed, Black Bolt, and Thanos. 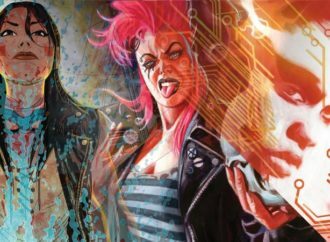 Jessica Jones and Captain Marvel are returning in new titles in July, and Iceman is getting a second run starting in September, but there are no announced plans for new solo books for the rest of the above characters. Besides the big #1 issues mentioned above there have also been a few other new series since January. In February, Tom Taylor, and Mahmud Asrar introduced a new team led by the resurrected Jean Grey in X-Men Red. In March, Greg Pak and Cory Smith welcomed the new character of Weapon H to his first solo series. In April, Saladin Ahmed and Javier Rodriguez introduced a new team of Exiles, and Gail Simone returned to Marvel and teamed up with David Baldeon on a solo book for the mutant mercenary Domino. And in June The Sentry is back yet again in his own solo book by Jeff Lemire and Kim Jacinto. Because apparently what the world needs in 2018 is yet another metaphor about mental illness where the hero’s “troubled mind” is in fact a cosmic horror. As someone whose mental illness is neither cosmic nor metaphorical, I will not be reading or in any way covering this book. 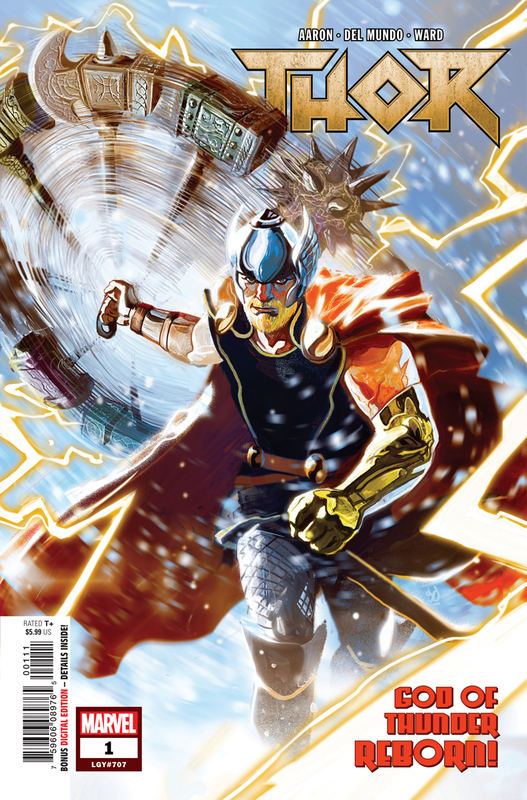 I knew the new Thor would be a change from its Jane Foster-starring predecessor, also by Jason Aaron, but I was surprised at how much of a change it is. Mike Del Mundo and Marco D’Alfonso’s art is quite different from Russell Dauterman and Matt Wilson’s work, both in style and in color palette, but that’s to be expected. But Aaron’s writing is different here as well. Jane’s comic was an epic tale of heroism and sacrifice. Odinson’s has more of a wild, post-apocalyptic action movie feel. Definite shades of Mad Max. 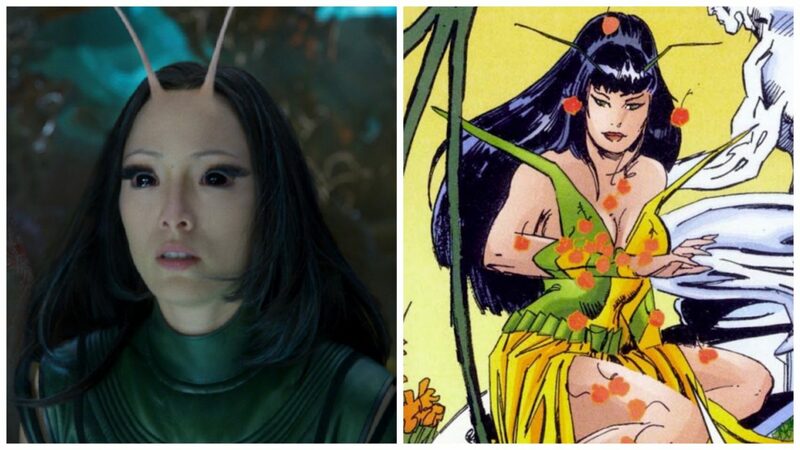 The Bifrost is destroyed, Asgard is a wasteland, and its survivors are once again refugees on earth. Thor Odinson is back wielding, well, rather a lot of hammers, since Jane sent Mjolnir into the sun, and Loki is back too, as a main player once again, out from the shadows he lurked in for most of The Mighty Thor, although what game he’s playing is still predictably unclear. This is a great first issue, putting all the various characters in play and establishing a madcap and somewhat surreal tone and art style that sets it apart from its predecessor. I’m particularly fond of the entire sequence where Thor fights Loki, while his murderous hel-hound Thori gleefully eats an entire shark in the background and then rolls around in the carcass. Squirrel Girl never ceases to be a delight. Ryan North and Erica Henderson had a great gift for taking the most ridiculous-sounding concept and giving it heart and depth. Derek Charm recently replaced Henderson as artist and has proved himself a worthy successor, with a style that is distinctly his own, but is close enough in tone to Henderson’s that it doesn’t feel like a jarring change. The transition is eased by Rico Renzi’s continuing on as color artist, giving the book a consistent palette through the artistic transition. 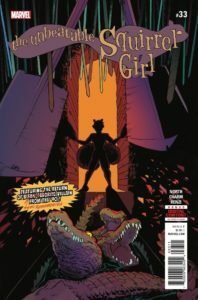 In an attempt to become closer to her friends while not fighting crime, Doreen Green invites her entire supporting cast, including Kraven the Hunter, to visit an escape room together. But this is comics, so of course the normal-seeming escape room turns out to be a diabolical trap for super-powered heroes. 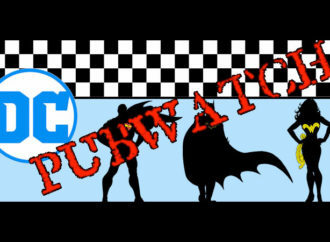 Cue puzzle-solving shenanigans where everyone gets to use their unique skills and knowledge, including a secret Squirrel Girl power never before revealed in comics, the hilarious appearance of a justifiably-forgotten 90s villain, a cameo from the Kra-Van, and a twist ending where everything goes decidedly pear-shaped for our band of heroes and semi-reformed villains. 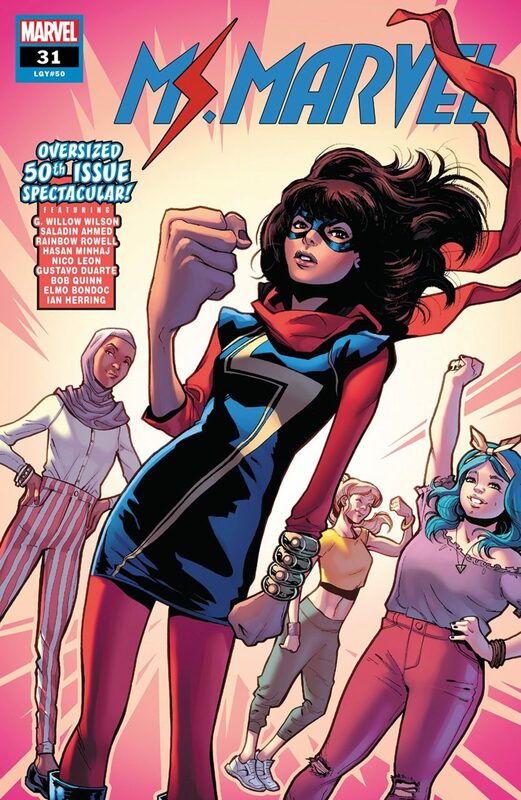 If you count all the issues from the pre and post-Secret Wars versions of the title, this is the 50th issue of Ms. Marvel. 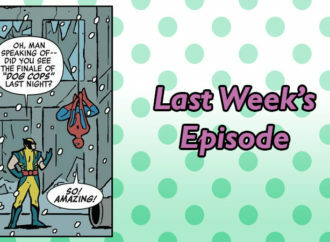 In celebration of that milestone, G. Willow Wilson and Nico Leon tell a classic story about a teen hero trying to balance her social life—in this case a long-desired slumber party—with her heroic alter-ego. Kamala’s slumber party serves as a framing story, for fun, low-stakes heroic interruptions as told by Saladin Ahmed and Gustave Duarte, Rainbow Rowell and Bob Quinn, and Hasan Minhaj and Elmo Bondoc. I particularly loved Rowell and Quinn’s story about a pizza delivery girl who’s bitter about her less-than ideal inhuman power. As has been consistent in Ms. Marvel, the disparate, but similar, art styles are tied together by Ian Herring’s beautiful and consistent colors. The best parts of this issue are the little human moments that bring Kamala’s world so much to life. Kamala attempting to explain slumber parties to her mother, the friends sharing teenage secrets about kisses and crushes, everybody drooling over Kamala’s mother’s delicious-smelling samosas: these small-seeming details are what ground the fantastical stories and make Ms. Marvel such a pleasure to read. 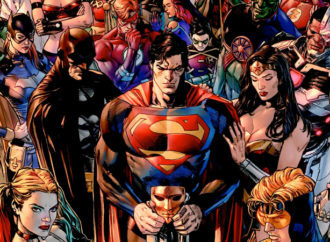 Character changes never last in superhero comics, which is sometimes comforting when a writer takes a character in an unfortunate or poorly thought out direction, but often frustrating because character growth and unexpected transformations make for some of the most fresh and compelling stories. Case in point: Victor Von Doom’s current attempt at something resembling heroism as the Infamous Iron Man. This Marvel 2-In-One Annual finally reveals some of what passed between Doctor Doom and Reed Richards at the end of Secret Wars, and seems to be laying the groundwork for Doom’s return to outright villainy, but it does it so well I can’t even hate it. Chip Zdarsky writes this version of Doom better than anyone else has, in part by highlighting all the ways Doom hasn’t really changed at all. His intentions are better, and his methods are different, but even as he’s arguing with an alternate universe version of himself about his need to embrace his humanity, he can’t quite hold back the superior attitude and hair-trigger temper that have been his downfall so many times before. Declan Shalvey has a particular skill for capturing the subtleties of facial expressions, which serves the characters well in an issue that hinges on a series of fraught conversations and flashbacks. Jordie Bellaire varies her color palette nicely between the different sections of the story, making the transitions between time periods and realities distinct and easy to follow. 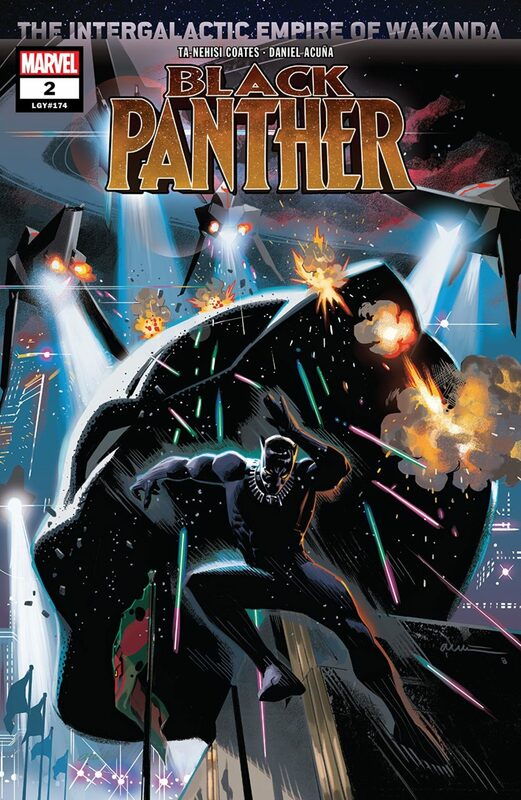 Ta-Nehisi Coates’s first Black Panther series, with its focus on the intersection between internal political conflict, national myth-making, and destabilized borders was long-arc comics storytelling at its best. The topical plot and the rich, classic superhero art of Brian Stelfreeze, Chris Sprouse, Wilfredo Torres, and Leonard Kirk gave it a real grounding and relevance in the present political climate. In this new series Coates, now paired with artist Daniel Acuña, takes everything in a completely different direction and, much to my surprise and disappointment, I don’t like it at all. “The Intergalactic Empire of Wakanda” starts in media res with the introduction of a character who may or may not be T’Challa, and may or may not have had his memory wiped, escaping from prison and joining a rebellion against a brutal intergalactic empire. It has all the makings of another cogent political analysis couched in a compelling comic book narrative, but I just can’t bring myself to care. The biggest strength of the first series was the web of complicated and diverse relationships among the large cast of characters. There’s none of that here. The characters either have no memory of their past or come across as one-note villains. 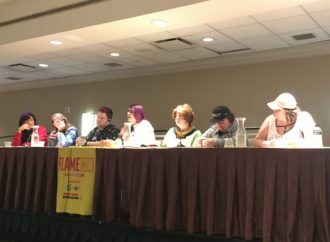 Without those compelling relationships there’s nothing for the plot to hang on, and nothing to make me care what happens to any of these people. I have often loved Acuña’s art in the past, but here I found it dark, muddy, and hard to follow. Half of this issue is a high-speed air battle/chase, but both the art and the dialogue are so difficult to follow that I’m honestly not clear what precisely happened or what the point of any of it was. I wanted so much to like this book. I even broke my own rule about never buying anything with a Greg Land cover, because I wanted so much for this to be good. As an old-school X-Force fan, I’ve always loved Domino, and I’m always up for a found family narrative, but three issues in, the writing and the art aren’t selling this one to me at all. David Baldeón and Anthony Piper’s art is an unfortunate combination of over-exaggerated facial expressions and badly-done cheesecake, all big eyes and pouty lips. Jesus Aburtov’s high-contrast colors add to it a garish and cartoonish feel that I just found completely offputting. Gail Simone’s weakness as a writer is a tendency towards over-dramatic and cheesy dialogue, and that’s very much in evidence here. Even the inclusion of some sweet bonding between Domino and Amadeus Cho, and a surprise last-panel appearance by an underused character I adore, don’t leave me remotely interested in picking up the next issue.